This winter I did two workshops in Lofoten, the first in February with Jonas from Vagabond Expeditions. 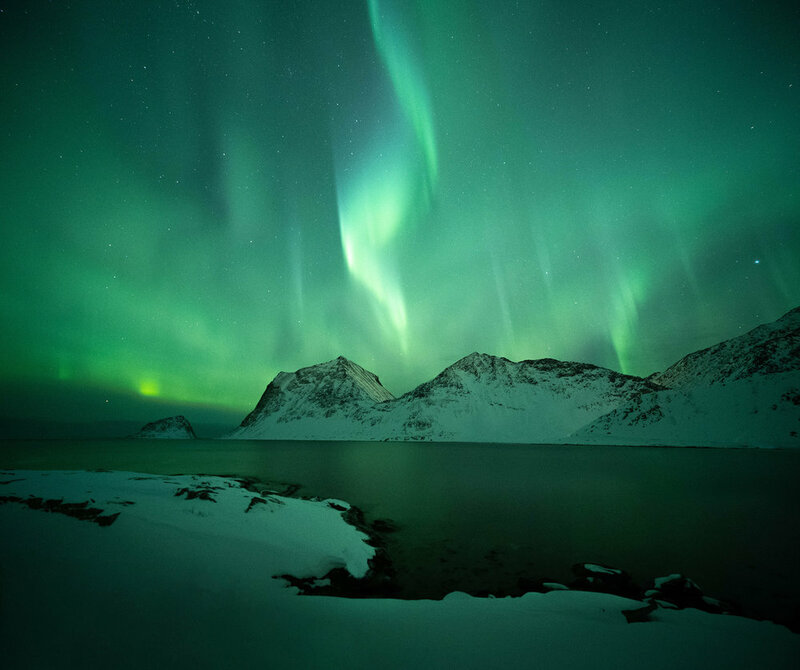 I love Lofoten in Winter, it’s an amazing place and I was really excited this winter to be going there twice. For the first trip I got there a few days before the workshop started as Jonas and I wanted to record some video footage and explore the area a little. There had been several days of heavy snow and by the time I arrived there was up to 1 meter in some places and the whole area was blanketed in beautiful deep snow. On our first days out shooting it was a little weird going to the coast and finding snow drifts that went all the way to the surf, and occasionally a foot would go all the way through the snow and into the water that was actually flowing beneath it. This was particularly challenging when we headed out to try to capture the aurora at Uttakliev beach. After passing through the tunnel the road to the beach quickly became impassable because of the deep drifts, so we set off in the dark to try to find a place where we could shoot from. Its was challenging as it was pitch black and impossible to see the rocks in front of us or where the ocean was flowing underneath the snow. Add in incredibly high winds and it was quite a tricky shoot. Focusing when shooting the aurora is always problematic as you can’t see anything to focus on, and the infinity settings on most lenses are set to optical infinity, which isn’t the same as real infinity, so just putting the focus ring there can mean that the images aren’t sharp. To avoid trial and error at the location in the dark it’s always better to find out where your lens actually focuses to real infinity beforehand. The aurora was particularly strong on this evening, and after we’d captured some shots in Uttakliev we headed around the coast to neighbouring Vik beach just before it died down. The fresh snowfall really gave all the locations an incredible feel. White snow creates really clean images and really encourages a kind of minimalist palate and tone. Just looking for small elements in the foreground to balance the image is much easier when the snow covers a lot of the visual “noise” that we often find on location, and just a simple bit of grass breaking through the white carpet, or places where the wind has shaped the snow is usually enough to create an interesting foreground. For the most part the weather was quite overcast with frequent heavy snowfalls, but we did have a couple of nice sunrises, one in particular when the fjord around Flakstad was almost a perfect mirror of the sky above, but for the most part we were creating compositions with dark, brooding skies, and sometimes like in the image of the yellow huts of Sakrisøy below, the cloud was so thick that the background just disappeared. We also spent some time exploring different parts of Lofoten and trying to find locations that hadn’t been photographed so often. The stretch of south coast of the island of Vestvågøy heading east from Ballstad has some fantastic views, particularly around Steine, which we photographed at sunrise.